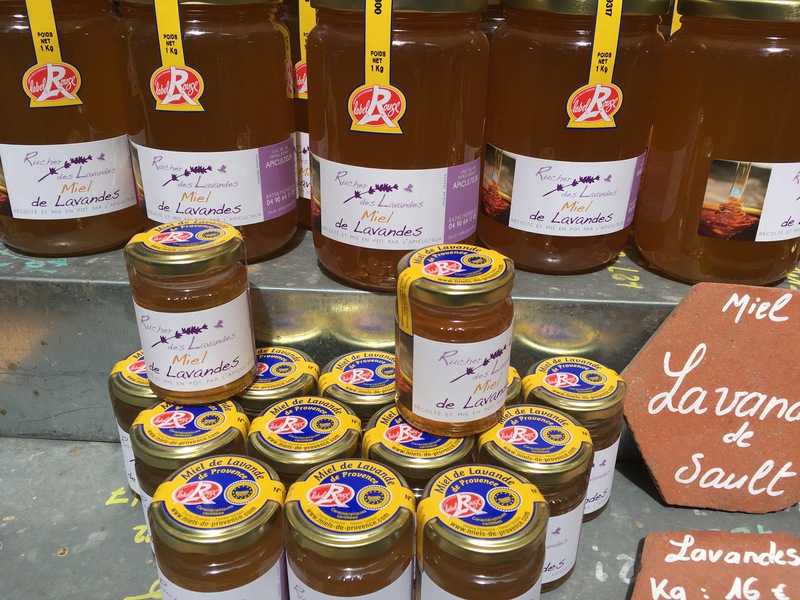 I do enjoy a good festival – whether it’s a big County Show in England or a small local food event in France such as The Honey Fair at Goult this year. 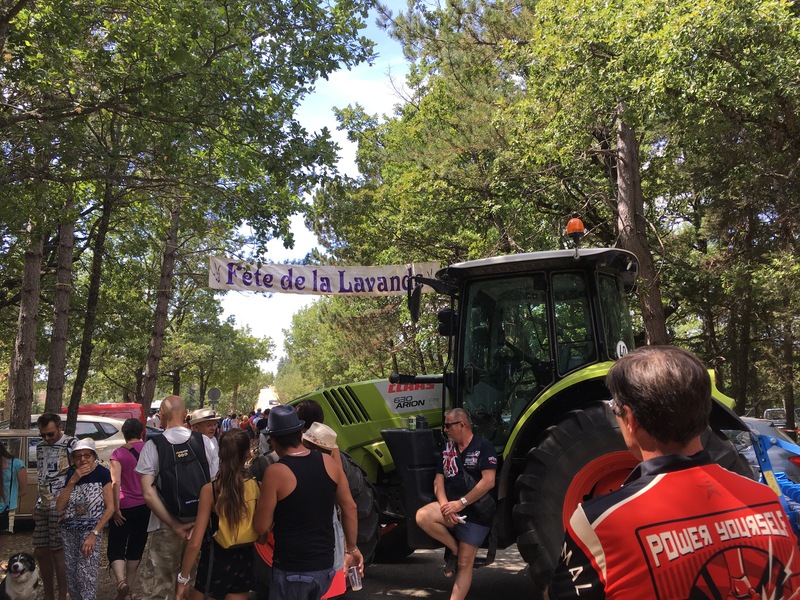 With that in mind, the signs for the Fete de la Lavande at Sault were too much to be ignored so yesterday Andy & I hopped on our bikes and headed off to see what it was all about. 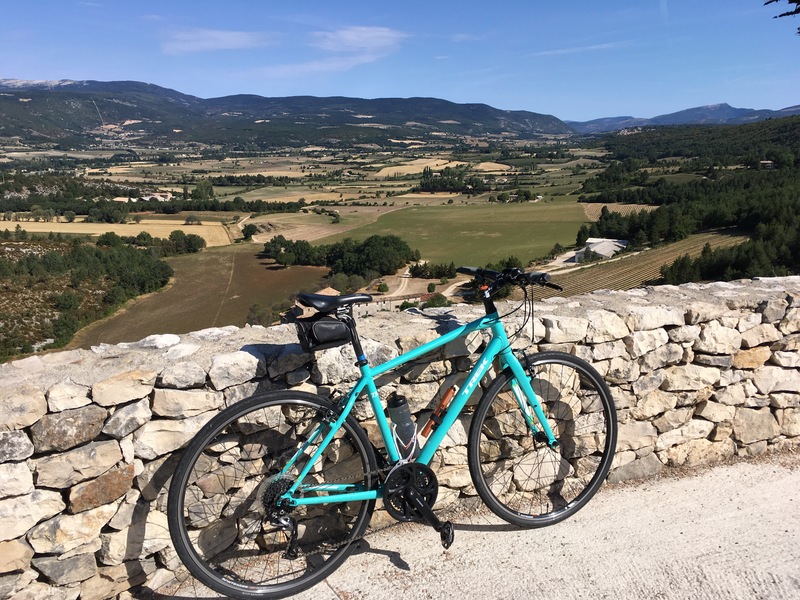 I’m sure many people think we’re mad cycling somewhere, rather than driving, but we’ve always felt the ‘getting there’ is as nice (if not nicer) than actually being there – and on the practical side it’s always much easier to park a bike than a car! 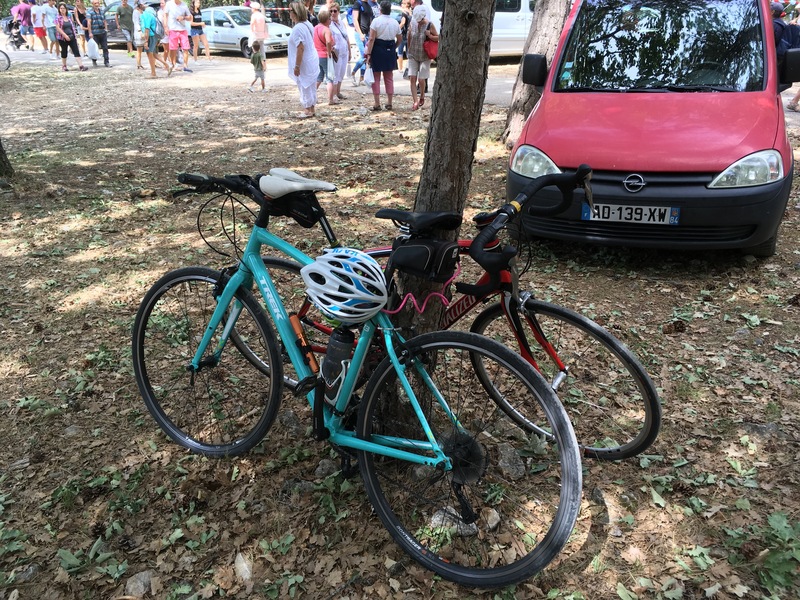 When you arrive by bike there’s always a tree to use as an ideal parking spot! 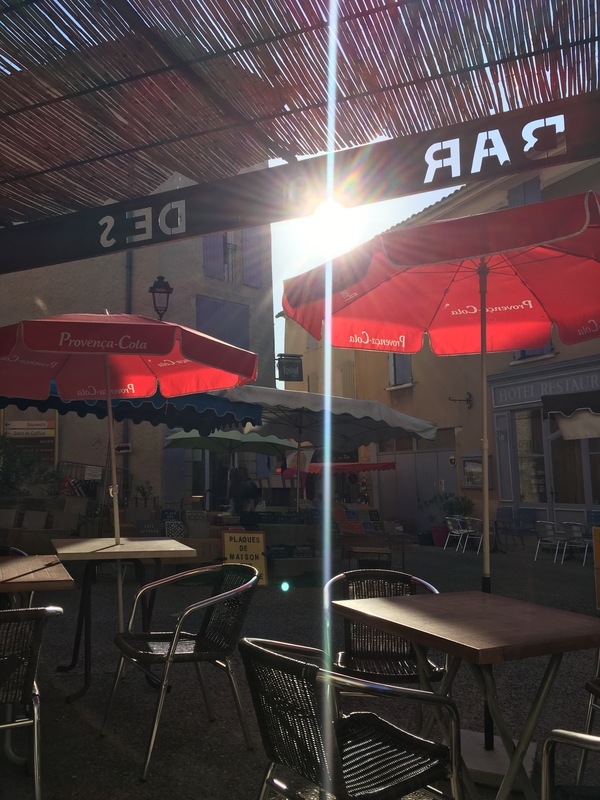 So we set off early, stopping for coffee & a pain au chocolat in Saint Saturnin, which was already busy with it’s Tuesday Market & after a quiet sit & chat for a while then headed on up and across the Plateau to Sault. 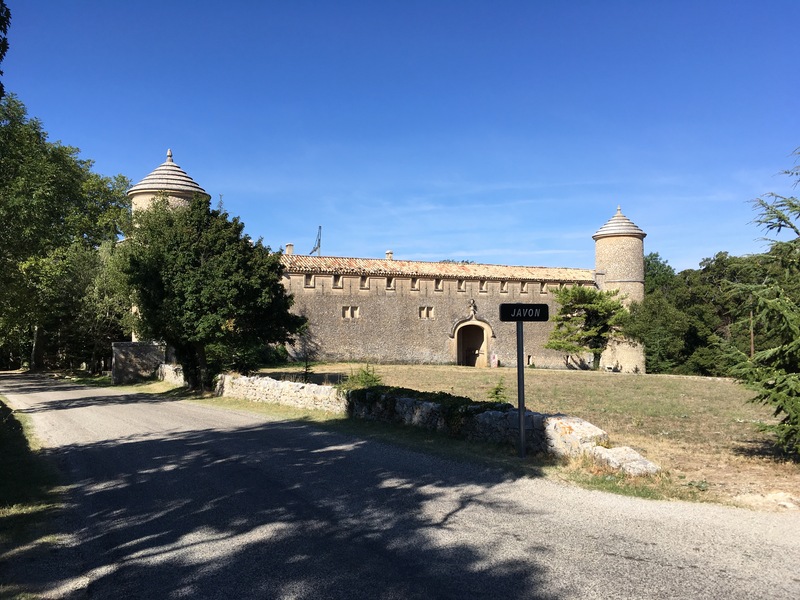 The ride is lovely taking you up past the stunning Chateau at Javon…..
Before dropping down towards Sault, where the road gives you great views across the valley towards Mont Ventoux. It’s amazing the difference that a few weeks make. 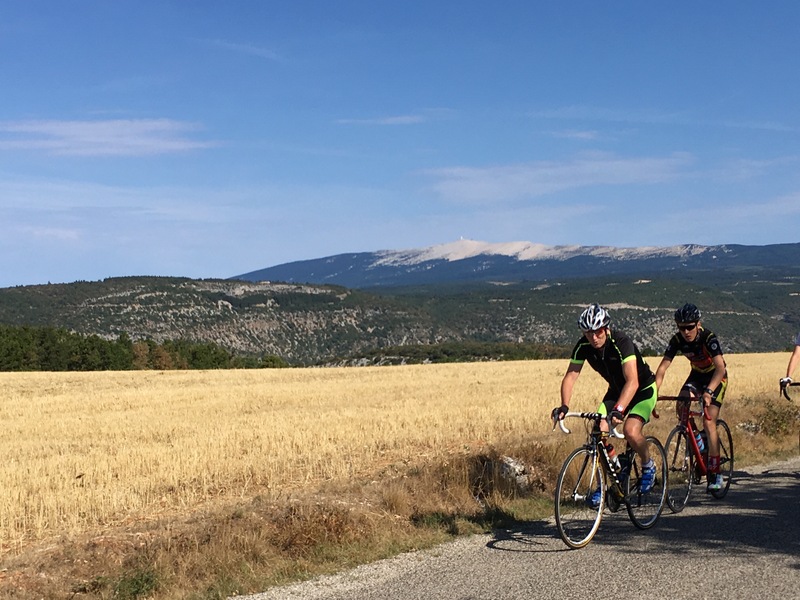 The last time we cycled through, the valley was a spectacular patchwork of green, gold and purple, with the lavender fields in full bloom….. Whereas now the fields have been stripped of their colour and the valley has started to take on the golden hues of late Summer and the Autumn to come …..
On the way across we noted that the road was much busier than normal, but thought nothing of it really, until we dropped down towards the main road into Sault, where cars were parked on both sides of the road and there was a steady stream of people walking up into the town. On our bikes we managed to nip around the traffic – although I’m not sure you can describe what I do on a bike as in any way ‘nippy’ – and arrived in the town centre, which was already filled with people wandering around the closed main street. 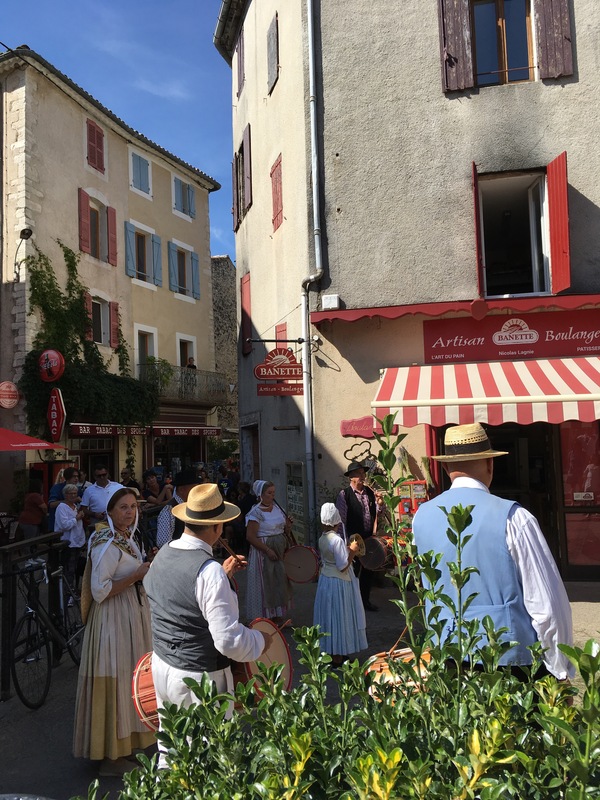 We sat on a wall watching the Provençal band from Pernes, playing outside the Boulangerie as the scent rose from heads of lavender being crushed beneath their feet – the perfect way to relax after a warm cycle across! 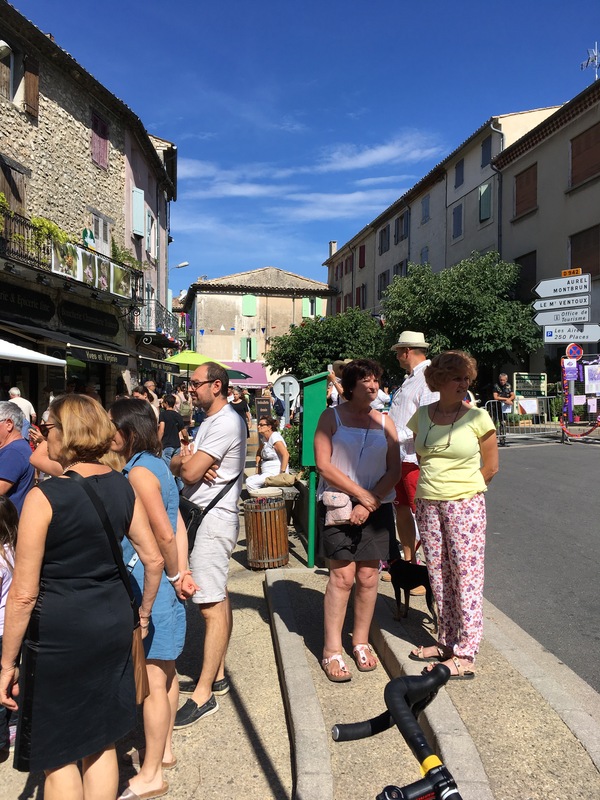 This Provençal band from Pernes have had a busy week – they were at Apt Confit Fruit Festival on Sunday! 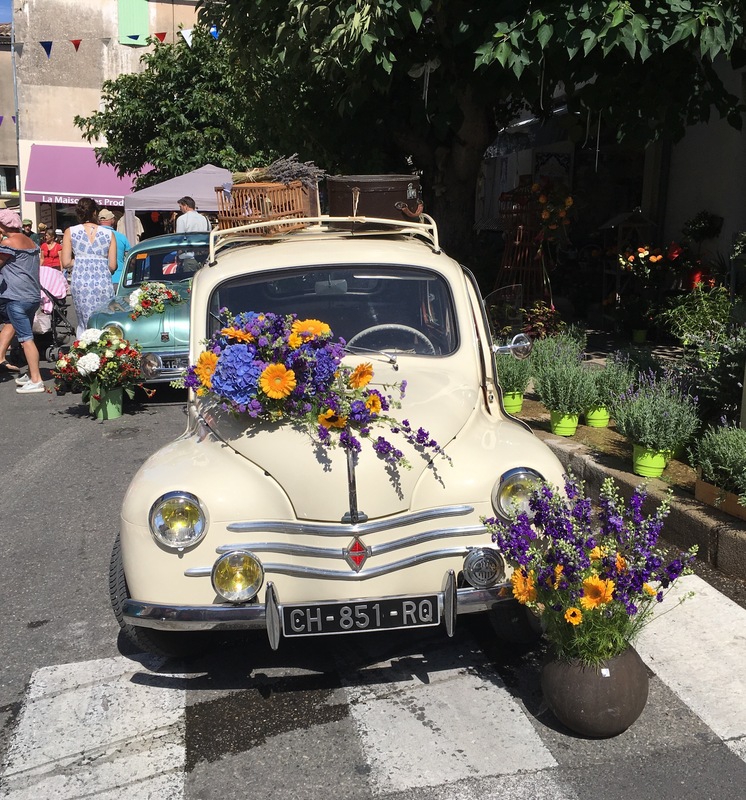 The main road through the town was closed off, with shops spilling their wares onto the pavements and old cars decorated with flowers helping to set the scene, whilst a rather good and very jolly Jazz band played in the background. 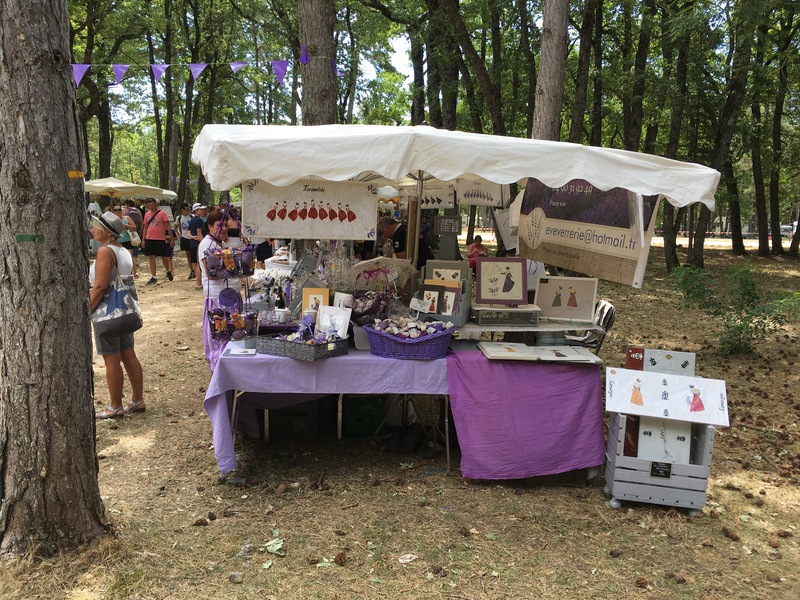 It was much busier than I had anticipated and there was a lovely atmosphere, with the different music mixing with the general babble of voices and the ever-present, heady smell of lavender. 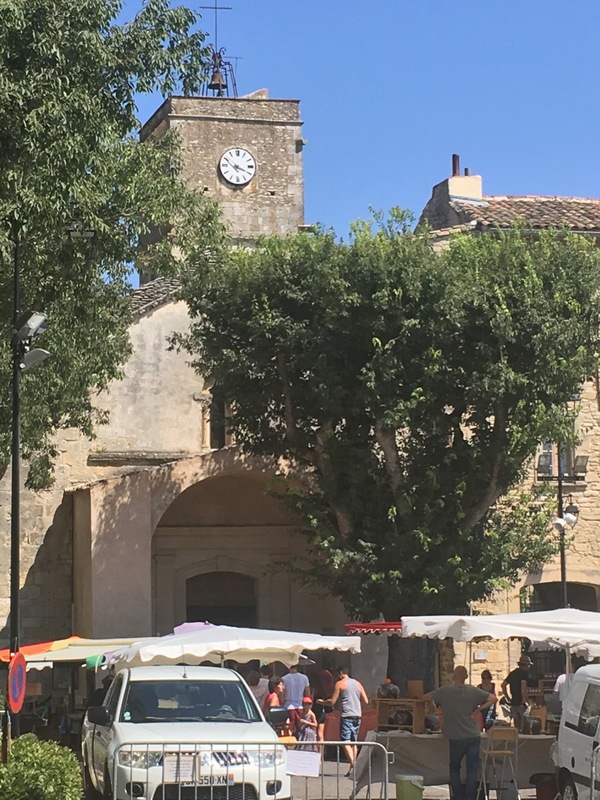 The main event though is not based in the town itself, but is sited on the ‘Hippodrome’ some distance away, past the town’s Intermarché. 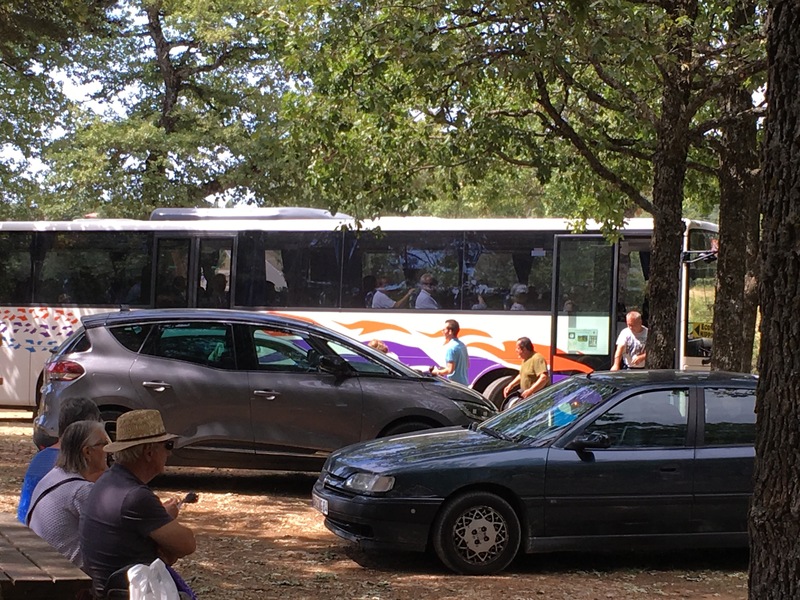 It’s easily walkable, but there are also free shuttle-buses running every few minutes from the main town centre car park up the hill to about 500m from the entrance and these were being well-used, both heading to and from the main event. 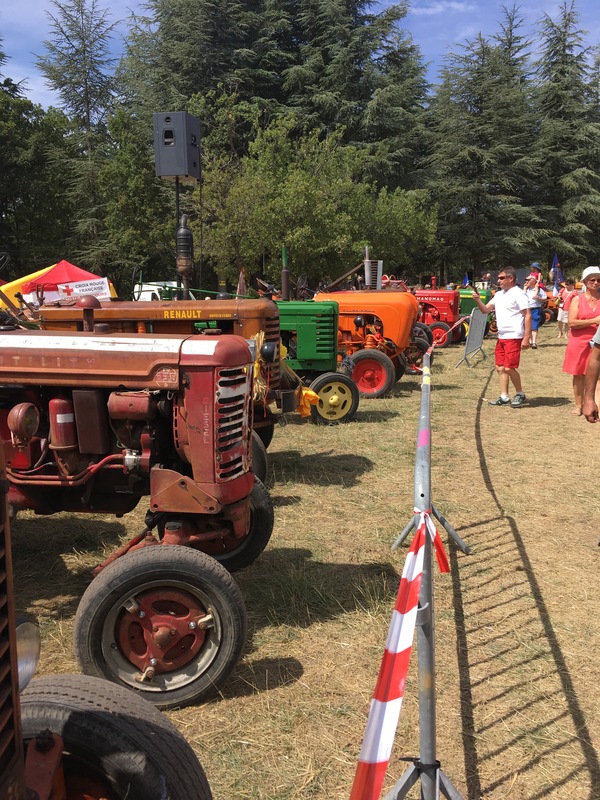 We took the easy option though and cycled up, again passing the cars and joining a steady flow of people heading to the show. If I’m honest, I’m not sure what I had expected, but it wasn’t really what we found. I visited the Apt Festival last year, which was lovely, but today’s event was on a much bigger scale and had drawn thousands of visitors, who were packed into the site under the trees. 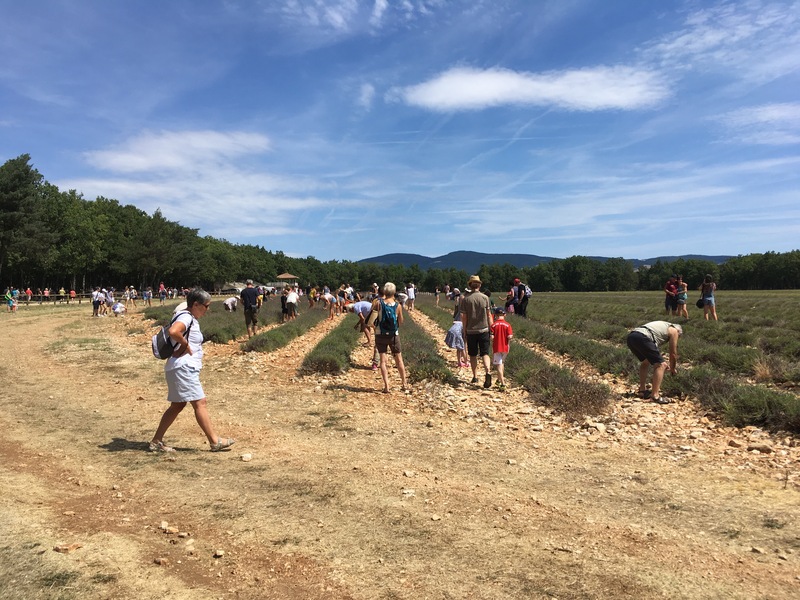 To producers of dried lavender, oils and other products…. 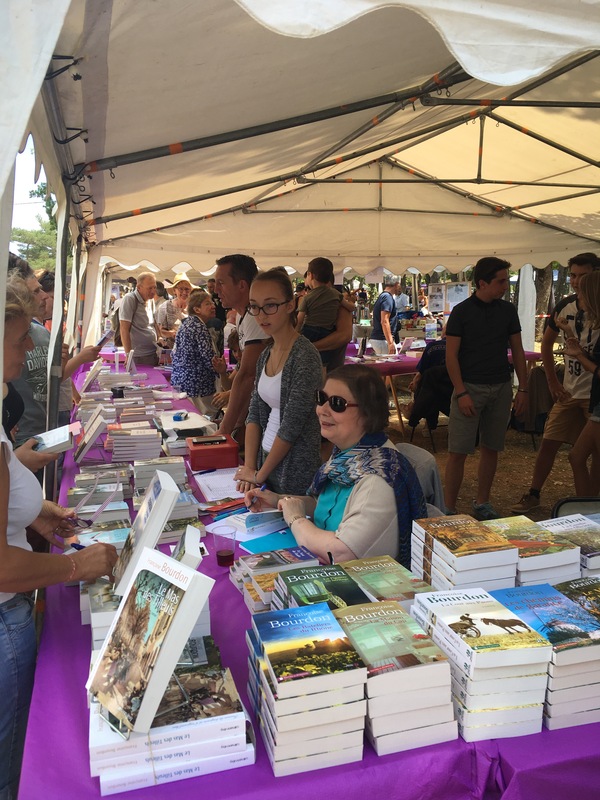 There’s even a large area set aside for book-signings with local authors, almost like a small literary festival….. 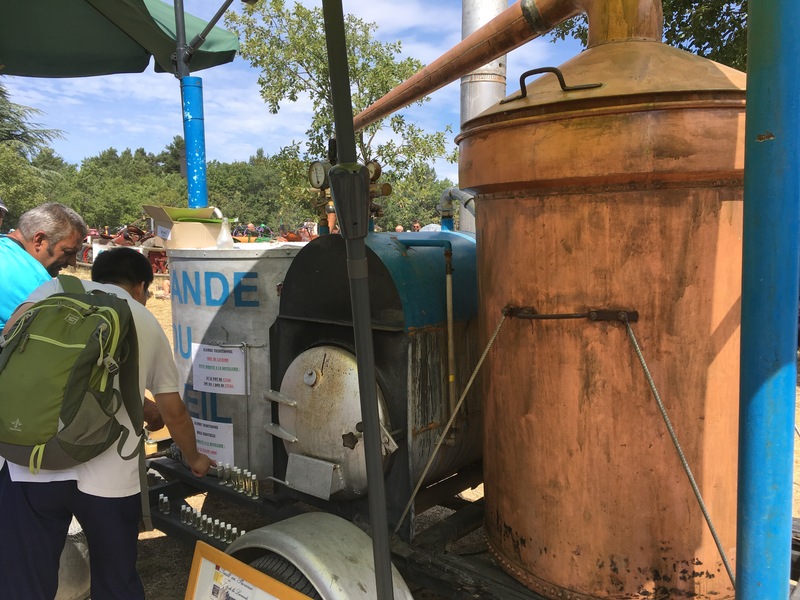 There was the mobile lavender distillery giving a demonstration of the process of extracting oil from the flowers and the scent of the steam coming from it was wonderful….. 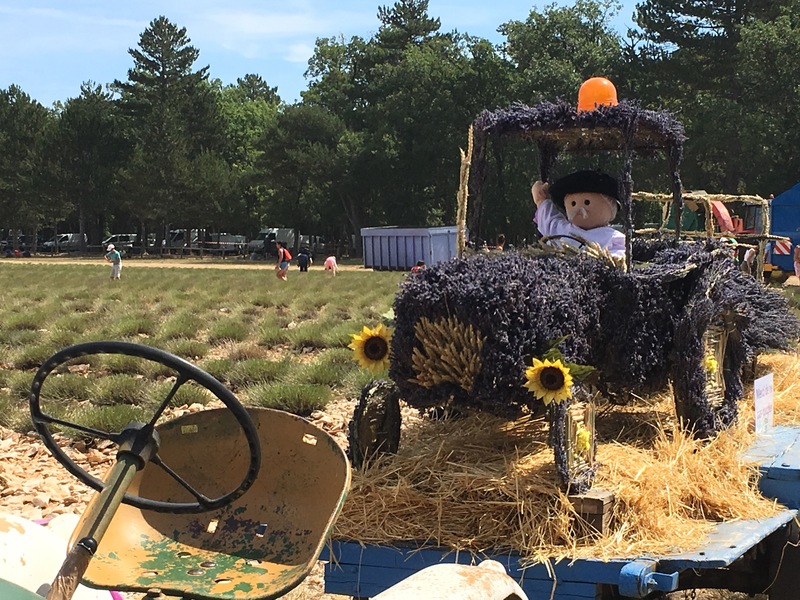 The centre of the racecourse itself is a huge lavender field and today it was filled with visitors picking the flowers and wandering off with filled baskets, bags and even sheets that had been turned into carriers. I feel lots of homemade lavender bags will be filled over the coming days! Around the edge of the racecourse there was a great collection of vintage tractors, much more reminiscent of the County Shows at home. 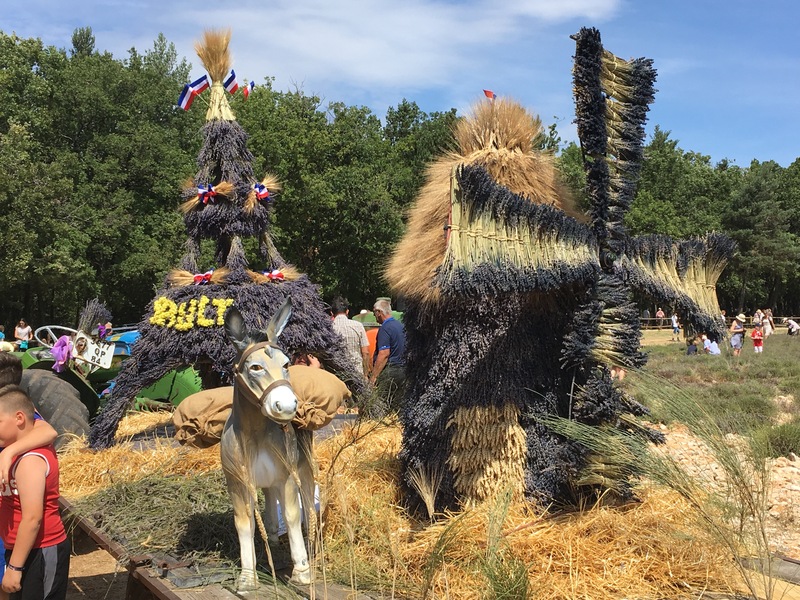 All in all it is a delightful event and worth a visit, evidenced by the huge number of people who had made the effort to go. There is something for everyone, including a ‘petting-farm’ for children and it was easy to while away the time that we were there. 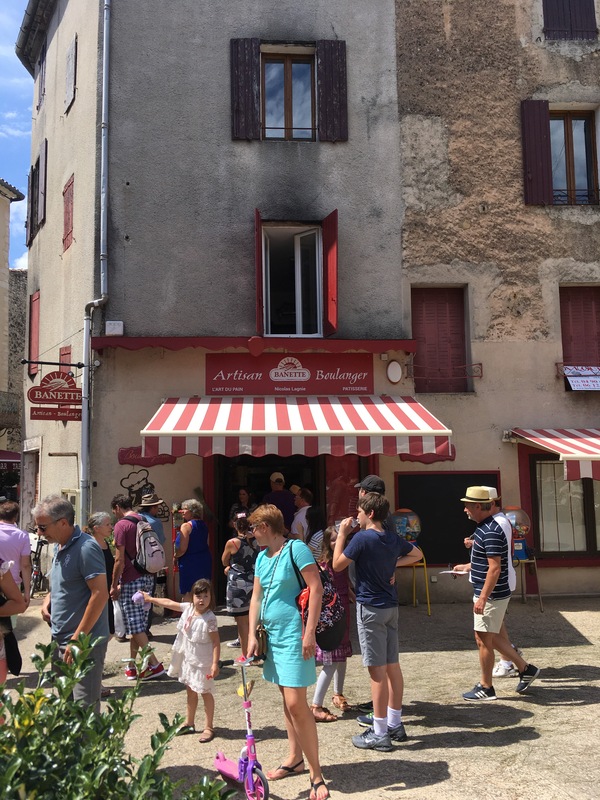 We finished off eating a sandwich outside the Boulangerie back in town just enjoying the atmosphere & the music from the Jazz Band, performing outside the neighbouring Confiserie, before heading home, after what had been a really lovely day – a fantastic bike ride and a wonderful French Festival – can it get any better? As ever on bikes it isn’t easy to carry any purchases, so the lavender pâté will have to wait for another time. Next Post Cycling, Coffee & Croissants! 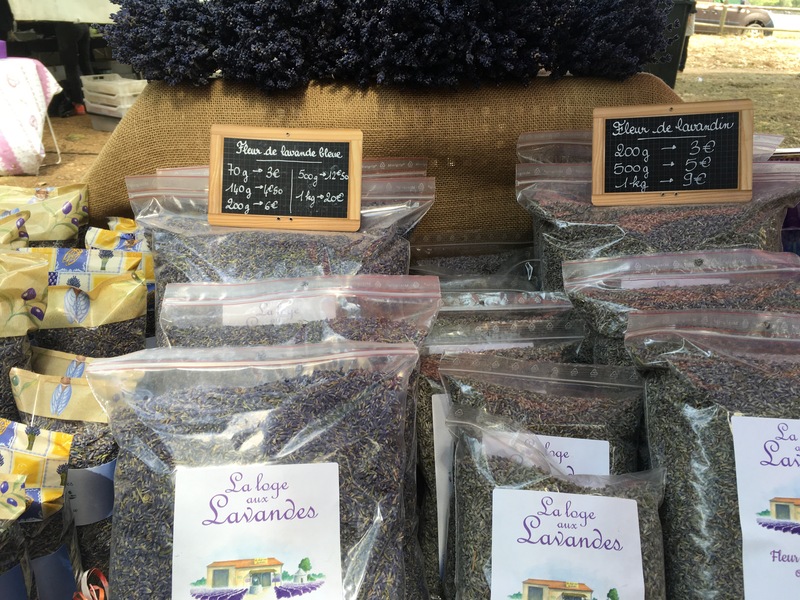 I know – I must admit I love Lavender, but not sure about that! Pretty hard to argue with biking when you have a view like that! I bet the air smelled divine! Funny thing, there is a little island in Lake Michigan in Door County, WI that grows lavender. 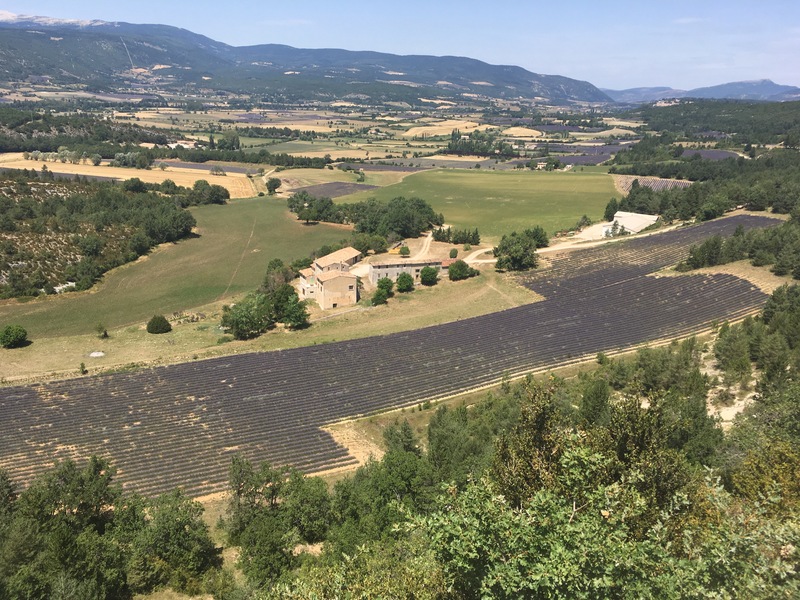 Not the hot and sunny place that Provence is, but it still thrives because the plant certain varieties. 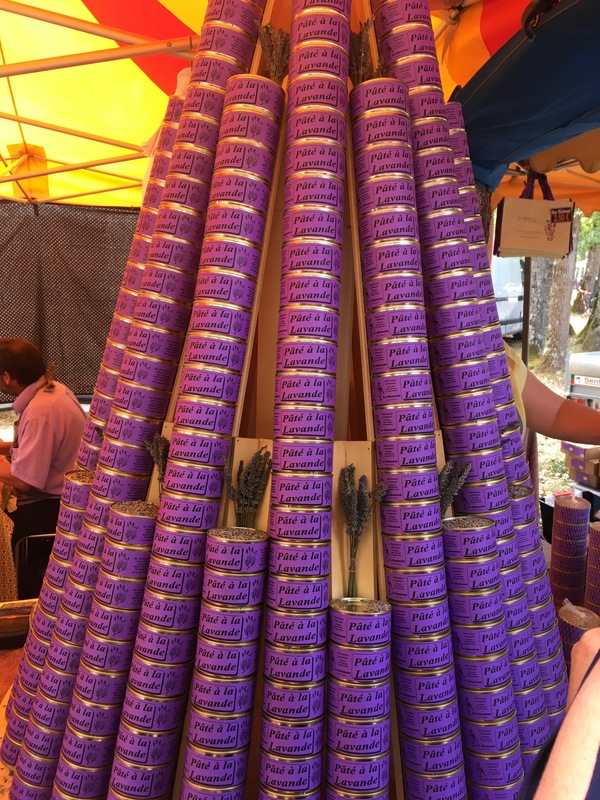 Anyway, they did a similar thing recently, a lavender fest and one of the cool things they make is gelato with lavender. The kids loved it! I have never heard of a pick your own lavender farm before, brilliant idea. I cook with lavender quite a lot and really enjoy the subtle flavour. Lavender shortbread is one of my favourites.